The Cedar Rapids Kernels open the 11th season in Perfect Game Field at Veterans Memorial Stadium on Monday, April 9th against the Clinton LumberKings at 6:35 pm. To celebrate the start of the season, the first 1,000 fans through the gates when they open at 5:30 pm receive a free Mike Trout bobblehead, courtesy of Great Clips. That’s not all! Lucky fans that receive a GOLD bobblehead also win a Mike Trout autographed baseball. Trout played for the Kernels in 2010 and was the youngest recipient in the history of the J.G. Taylor Spink Award as the 2010 Topps Minor League Player of the Year. 2012 season ticket packages and 10-game coupon books are on sale now at the stadium, or by calling the Kernels at 363-3887. Individual game tickets go on sale Monday, March 19th at 10 am and fans may purchase them a day early by coming to the 5th Annual Spring Fling on Sunday, March 18th from noon to 4 pm at Veterans Memorial Stadium. The 2012 Kernels arrive in Cedar Rapids on Monday, April 2nd and the first chance to meet the new team is on Tuesday, April 3rd as part of ‘Meet the Kernels Night’ from 5:00 to 7:30 pm. 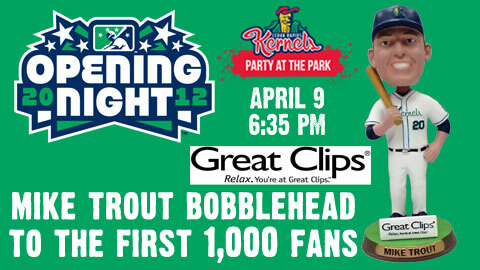 The Kernels open the 2012 MWL season on the road at Wisconsin on Thursday, April 5th. Cedar Rapids, IA – The Cedar Rapids Kernels, in conjunction with the Los Angeles Angels of Anaheim, announce their field staff for the 2012 season. Taking over as the Kernels Manager is Jamie Burke. The native of Rosenburg, OR was drafted by the Angels in the 9th round of the 1993 draft out of Oregon State University and played for the Kernels in 1994, hitting .264 with a HR and 47 RBI in 127 games. He made his MLB debut with the Angels on May 9, 2001 and played 191 Major League games with the Angels, White Sox, Mariners and Nationals as a catcher, infielder and even made an appearance as a pitcher in a extra inning game with the Mariners allowing one run in an inning of work to take the loss. He retired at the end of the 2010 season and this is his first season as a manager in the Angels organization. Chris Gissell takes over as the Kernels Pitching Coach. 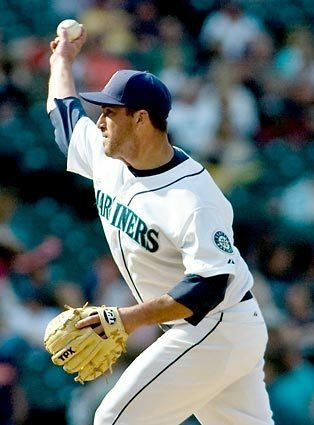 He was selected by the Chicago Cubs in the fourth round of the 1996 Free Agent Draft out of Hudson’s Bay HS in Vancouver, WA and pitched for the Rockford Cubs in 1997 and 1998, going a combined 9-11 with a 3.76 ERA in 31 games. He made his MLB debut with the Colorado Rockies on August 22, 2004 and appeared in five major league games with an 0-1 record over 8.2 IP. 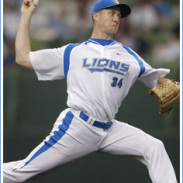 He has also pitched for the Seibu Lions in Japan in 2006 and Uni-President Lions in Taiwan in 2009. He was signed by Oakland as a free agent in 2007 and pitched for the Sacramento River Cats in 2008 and 2009. This is his first season as a coach in the Angels organization. Mike Eylward returns to Cedar Rapids as the Kernels Hitting Coach. He played for the Kernels in 2001 and 2002 after being drafted by the Angels in the 44th round of the 2001 Free Agent Draft. 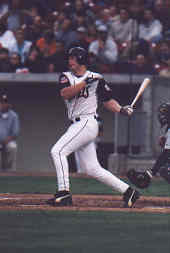 In 2002, he hit .263 with 8 HR and 43 RBI in 98 games for the Kernels. He played eight seasons in the minors and has been the hitting coach for the Orem Owlz the past two seasons (2009-10). Omar Uribe rejoins the Kernels staff as the team’s Athletic Trainer. Born and raised in northeast Los Angeles, Omar graduated from Long Beach State with both a Bachelor’s and Master’s in Kinesiology. He also holds a Career & Technical Education Credential in California. For the past 6 years, he has taught and provided sports medicine at Culver City High school and then Los Angeles Senior High School. While at LA High he also served as the athletic director. In the past Omar provided coverage for Cal State Los Angeles, USC, Claremont Colleges and various therapy clinics and gymnasiums. In 2002, Omar served as an intern for both the Atlanta Braves & Long Beach State Dirtbags baseball. He currently resides in Los Angels with his wife Norma. Joe Griffin returns as the Kernels Strength Coach. He has a degree in Kinesiology from the University of Maryland and is a Certified Strength and Conditioning Specialist through the National Strength and Conditioning Association. Along with various other certifications he had a 15-year baseball playing career and a strong knowledge base in nutrition for athletes. Before coming to Cedar Rapids, he was with the Washington Nationals and has worked with various universities in the Mid-Atlantic area. In addition he is the owner and founder of ESX Athletics LLC and has worked with hundreds of high school and collegiate athletes for over the past five years. The Kernels open the 11th season in Perfect Game Field at Veterans Memorial Stadium on Monday, April 9 at 6:35 pm against the Clinton LumberKings.